Synopsis: It's the night before the Winter Solstice. All the woodland animals are making gifts for the newborn Sun. But poor Spider doesn't have a gift. What will she do? A traditional Yule tale from Poland returned to its pagan roots, based on the tale told by my father. Also included is information on the Yule holiday in Poland and recipes and tips and ritual ideas to use them in a pagan context. Most stories of the Yule spider take place indoors and don't have a Solar connection. This is the only one I've come across that celebrate the birth of the Sun and the magickal night when the animals speak. The story itself is geared to be read aloud to children, however the tradition information is for adults. About the Author: A writer of fantasy and non-fiction metaphysics, Lionrhod (pronounced LION-rod as the h is silent) caught the writing bug at age 8. Inspired by her writer mother, she wrote an extremely lousy and highly plagiarized story about a pony. From there, she went on to focus on science fiction and fantasy as well as romance, and when she realized that she was a Witch, articles on Wicca and Magick. 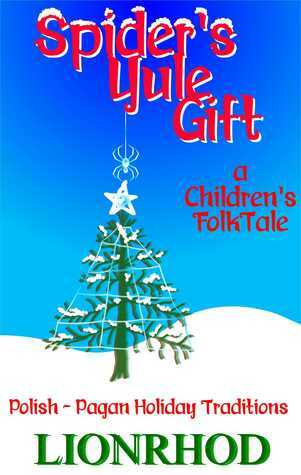 Review: A nice primer on a few folk traditions, and a cute story to read aloud to kids. Although this is marked as a kid's book, there are no illustrations. There are some good ideas on how to celebrate the solstice, especially as a family. A few recipes are mixed in, along with memories from Lionrhod's own childhood.